"Universal Life Energy is everywhere. ... [It] is the First Manifestation ... of the Great Principle, the Causeless Cause Itself ... As Universal Life Energy is limitless and all powerful, the more it flows into the body the stronger the individual becomes. [One of the physical ways to open to the inflow is through an exercise called by the author] The Star Exercise ... [it] is indeed a KEY TO ALL POWER, unlocking and bringing forth in Man all his latent powers and forces." This exercise is a simple, physical method for contacting the Universal Force that most everyone can do. Each of us are connected with the Great Creator, however, we have forgotten that fact and believe we are separate, not only from our Creator, but from all of Nature and each other. Through this exercise you are contacting the first manifested Power of Our Mother Father - Universal Life Energy. Energy, the first corner of the FourSquare, has within it All the Powers: Life, Intelligence, Law and Love; because in reality there is no separation. 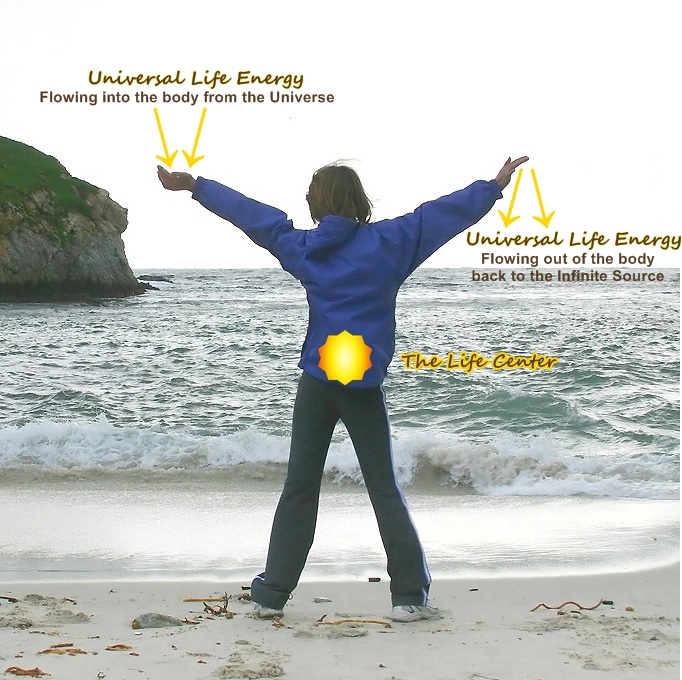 So when you contact Universal Life Energy by this physical means you are reconnecting with all the Powers, and also receiving all the benefits. You are putting into action one of the Laws of the Universe: the Law of Attraction or, the Law of Love, which states that "like attracts like". The Star Exercise works automatically because of this Law. There is no need to believe in it, or want it to work. The more you perform it the more you benefit, because it helps balance, heal, and re-establish Harmony in the body, mind and emotions. It goes where it is needed naturally because it works according to the Laws of Nature: Energy, Intelligence, Law and Love. It truly is simple, yet powerful. 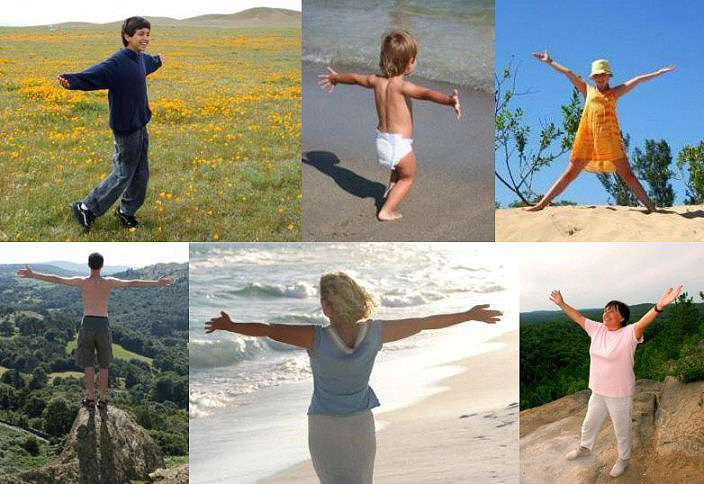 Open the body to Mother Nature by standing in the Star Position, preferably outside or near a window to additionally benefit from the fresh air. If you can not stand in the Star Position, then try lying on Mother Earth, in bed, or even sitting. The feet should be about shoulder width apart, with arms extended out on each side, at shoulder level. The left palm is facing up and the right palm is facing down. While in this position, take a few moments to check yourself. Consciously relax your body. You should be erect, but not tense. When possible, wear loose, comfortable clothing and no shoes. As with most exercises, it is best to do this on an empty or near empty stomach, as the influx of energy is powerful and can do a number on undigested food. The elder Lightbearers taught us that Universal Life Energy is like electricity, so treat it with Respect and use it Wisely. Now, begin to breathe deeply, in through your nose and exhale out through your mouth. In the beginning, your arms may feel tired, however, do not force yourself to keep them elevated. Slowly lower both arms, with your hands cupped up in front of you, to keep the flow of energy continuous. 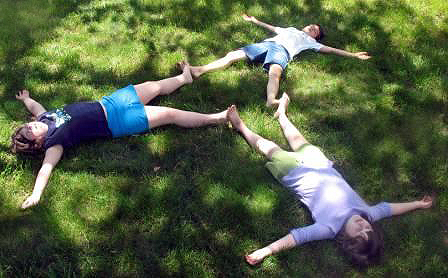 Once your arms are rested, go back into the Star Position. At first, three to five minutes, twice a day, is all that is needed. The best times to perform the Star Exercise are upon rising in the morning and just before going to bed. As you become accustomed to the inflow of Universal Life Energy you can extend the duration and number of times you perform the Star Exercise. When applied consistently, this exercise will bring about positive results in your life. It should become a part of your daily routine, starting today, for the rest of your life! When performing the Star Exercise you physically open yourself to a continuous influx of Universal Life Energy which goes wherever it is needed, re-establishing Harmony and Balance. In the following paragraphs is the method for the Star Exercise. The Star Exercise is good for everyone, no matter their age or physical condition. Children are especially adept at performing it - doing what comes naturally!